Ronnie O'Sullivan took less than an hour to qualify for the semi-finals at the Northern Ireland Trophy by beating Welshman Ryan Day 5-1 on Friday. Day take the first frame but O'Sullivan notched back-to-back centuries and he racked up 455 points in five frames. Dominic Dale will play O'Sullivan in the last four after defeating world champion Graeme Dott 5-2. Irish interest ended when Ken Doherty lost 5-1 by Ding Junhui, while Stephen Lee knocked out Shaun Murphy 5-4. "I played alright today. 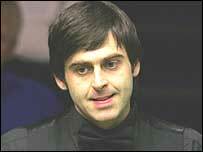 I'm going to go for my shots," said O'Sullivan after his impressive afternoon win at Belfast's Waterfront Hall. "For me, it's important that I play with a smile on my face," he added. "I know if I do that everyone else will be enjoying themselves. That's my way of promoting snooker." O'Sullivan put his foot on the gas, pocketing breaks of 54, 82, 104, 106 and a match-clinching 67 in the sixth frame to secure a semi-final berth. Dale continued his fine form this week against Dott. "Dominic played well. I had a nightmare start to the match," said the world champion. "He should have been 4-0 up. It's not that I played bad. I didn't do too much wrong." Dale won the opening frame with a 61 break and then went 2-0 ahead by winning a scrappy second frame. It was soon 3-0, largely thanks to a run of 40, before Dott pinched the fourth frame to trail 3-1 at the interval. Larkhall's Dott reduced his arrears further by winning the first frame after the resumption thanks to a break of 43, but Dale was not to be denied. The 1997 Grand Prix champion produced a tournament high break of 137 to go 4-2 ahead, before winning the match with a wonderful pressure clearance of 65. "This is the best I've played in a tournament - and it's only because I've started to believe in myself," said Dale. Ding Junhui controlled his encounter against Doherty and any chance of the Irishman getting back into the match was ended when he handed the Chinese player the fifth frame by missing a straightforward green. "I played well. It's a good start to the season," said Ding after his win. Doherty said: "I'm very disappointed to lose, but the crucial frames were the first and fifth. I missed two shots and that cost me. "I love playing here and I've had great support all week, but tonight was a bit of a letdown because I never got going.